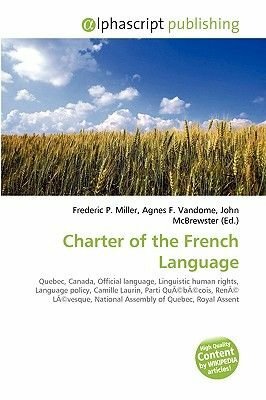 The Charter of the French Language, also known as Bill 101 and Loi 101, is a law in the province of Quebec in Canada defining French, the language of the majority of the population, as the only official language of Quebec and framing fundamental language rights for everyone in the province. It is the central legislative piece in Quebec's language policy. Proposed by Camille Laurin, the Minister of Cultural Development under the first Parti Qubcois government of Premier Ren Lvesque, it was passed by the National Assembly, and granted Royal Assent by Lieutenant Governor Hugues Lapointe on August 26, 1977. The Charter's provisions expanded upon the 1974 Official Language Act, which was enacted under Premier Robert Bourassa's Liberal government to make French the sole official language of Quebec. Prior to 1974, Quebec had no official language and was subject only to the requirements on the use of English and French contained in Article 133 of the British North America Act, 1867.